When Catholics speak of going to God through Mary, many Protestants often mistakenly think Catholics believe that what Christ achieved was not enough, or worse that Mary is somehow greater or more merciful than God. Obvious to Catholics both misconceptions are false. And, Protestants often assume that going “directly to God” means that only two individuals can be involved, that is, just Jesus and I. However, we cannot go to God using just our own abilities. See John 6:65. To go most directly to God is to go to Him His way. It means to go to Him where He is at spiritually - pure holiness - and in the way He most desires. Therefore, it means saying yes to each opportunity to receive the grace He wants to give to us, including the grace that He wants to give to us through others, for example Mary. Mary is a like a Super Highway where God administers His grace helping us to get closer to Him and to know Him better. This is because Jesus works through Mary in a special way. This is because she has been most open to His grace and does not hindered it. We cannot love Mary to much because God wills that we imitate Him and love her. Protestants wrongly assume that they do not need Mary. Since Protestants “have Jesus” they see no obliging or motivating reason to examine Catholic arguments for Marian devotion. In order to compel them to re-examine their false presumptions about the manner in which God desires to give them grace, it is wise to clearly state that he or she, the Protestant, is offending and insulting God by ignoring and or rejecting the work He is doing through Mary. Rejecting Mary and the work God does through and in her is a sin against God. At Fatima the children were called to offer up their sufferings for those who sinned in this way. See more on the Biblical context for suffering. The children would not have been asked to do this if those offences had not been sins. The diagram above represents how most Protestants perceive Catholic devotion to Mary. This perception completely undermines a legitimate devotion to Mary because in it Mary is completely separated from God (therefore our relationship with her would be devoid of His grace). The diagram above represents how some Catholics mistakenly portray Marian devotion in their attempt to show how we can go to Jesus through Mary. Unfortunately, Mary is portrayed by some as being more loving or as more merciful than Jesus. Besides those obviously heretical perspectives, it also undermines Marian devotion by showing Mary as being completely separated from Christ. Catholics know God desires us to have a love for Mary precisely because she is part of the Body of Christ, the Church. She is united to Him. 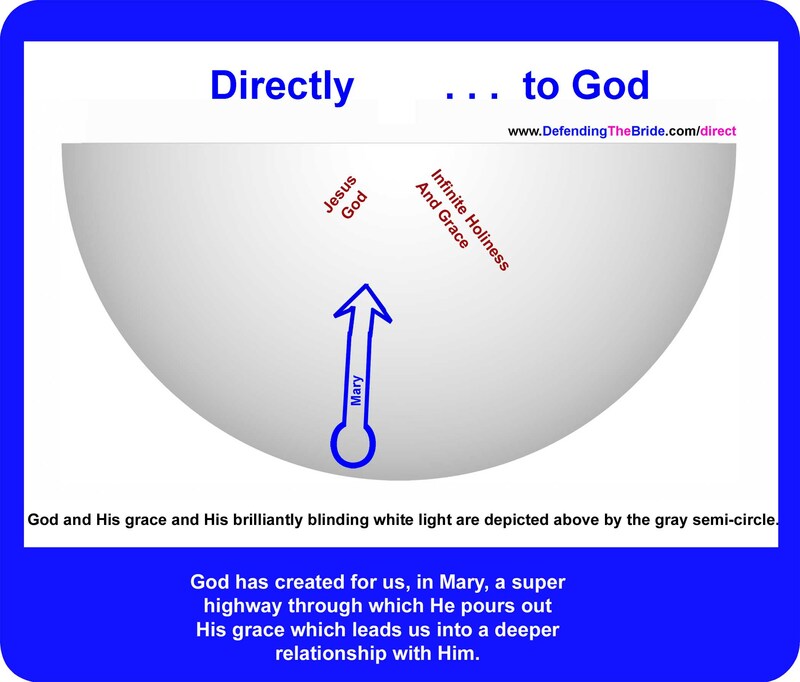 His grace works through her; so, I believe the diagram below more faithfully represents a Catholic perspective of true Marian devotion showing how Mary is in Christ. Why Go to Mary ? The purpose of this pamphlet is to help everyone put Jesus Christ in the center of their lives, and to go more directly to God. Although this story is a fictionalized account it contains many Christian truths about what is most important. It also describes how we are to accept His Sovereignty in our life. My name is Paul. I am a Christian and I wish to share the Good News of salvation. There is only one way to heaven and that is by faith in Jesus Christ the One and only Savior. I desire to help others go to Him in the most direct way possible. Acts 4:12. As a Protestant, I enjoyed talking with Catholics about the Bible, and I struck up a friendship with Carl, a Catholic. I have chosen to describe our conversations below with the hope that others will draw fruit from it. My statements are in Red while his are in Blue text. so obviously we agreed on many important issues. “I would never waste my time asking Mary to pray for me, or even giving serious consideration to your arguments attempting to justify it. Why settle for something that was at best second best, e.g. Mary, when I could go directly to God? "So, do you accept Jesus as the only way to heaven and that salvation is a free gift of faith that no one can earn no matter how many righteous deeds one does?” I asked. I asked, "Do you agree that we should go perfectly and directly to God and ignore the saints?" Carl asked, "We do need to go directly to God, but we need to investigate exactly what that means and how we are to do that. What good thing can you accomplish on your own, in a most perfect way, by just using the whatever grace you already have? Or, What can you do as well and as perfectly as what God can do?" I answered, "Well, nothing actually. We are all sinners. We always need to ask God for His help. He is the Perfect One." Carl replied, "Correct. Consider the following scenarios. In the first, a man attempts to accomplish some good using whatever strengths and graces God has given to him up to that point in time. In the second scenario, the man asks for God’s help and receives even more of His grace before proceeding. Which scenario will accomplish the better result?" Carl answered, "Correct again. Our imperfections and our limited abilities make our paths crooked. So, the man who opens himself up to receive the help and grace God wants him to receive through the saints, will be able to go more directly to God." "But, God doesn’t need the saints," I stated. Carl responded, "True, but strictly speaking what does God need? Nothing and no one at all; however, He still chooses to work through others. He works through Matthew, Mark, Luke and John, and He chooses to work through Bible preachers and many others. God works through our relationships with them to give us grace. The question is not who does God need, but am I willing to humble myself and open myself to all the graces that He wants to give to me through others so that I might go more directly to Him. "So, we must choose between your way of ignoring the saints and opening our eyes to discover that super highway which God has built and upon which He invites us to come to Him. The saints on earth, and especially those in heaven, are united to Him. They make up the Body of Christ and they are the super highways God has built for us to aid us in going to Him." "O.K. Now, I can see my claim of going directly to God was based on certain assumptions, including that I could accomplish that goal by myself. I was wrong in thinking that it gave me an excuse to reject the arguments for devotion to the saints without even considering them. Now, I see that my desire to go directly to God actually requires that I investigate how He may want to work through others to help me do just that. I was wrong to arrogantly assume my understanding of truth must be His way. Since are all weakened by own sins I need all of His help and grace that I can get. Now, I am ready to examine the Catholic claims that God wants to work through Mary so that I might go more directly, more completely, and more deeply into Christ. But, why do you Catholics place a special emphasis on honoring Mary ? Yes, Catholics follow the Biblical command in Luke 1:48 to honor Mary. Be clear on this, the Catholic Church clearly teaches that idolatry is a sin. Each Sunday, Catholics profess, in the Gloria, that we worship God and that He alone is the Most High. The purpose of Marian devotion is to help us to love Jesus more. The primary reason we honor her is because of what God has done in her. Even more important than her vocation as Jesus’ mother, was how God perfected her heart and her faith by His grace to which she was totally open. See the Uniqueness of Jesus, the God-Man. Mary is the perfect work of Jesus Christ. She does not detract from His glory, rather she reflects and refracts that glory. She does not undermine it, but rather she manifests His glory. She does not rob, nor does she diminish Christ of His glory, but rather she is the one who magnifies the glory that Christ gained for us through His redemptive work, (Luke 1:46). I have discovered that going to Mary is not a detour, but rather it is a sure path. I have discovered the reason we go to Mary and love her is because it brings us more deeply into the mystery that God, who is love, works through her to help us to love Him more and to follow Him more closely. By humbling ourselves and going to Mary we open ourselves up to receive the grace God provides. I have converted to Catholicism. Now, I just try to help Catholics become better Catholics by helping them go more directly to God by appreciating how He works through the saints and through the Church He built upon Peter. I begin by contrasting the three different diagrams representing various understandings of Marian devotions. See them here. Print this web page onto a one page foldable pamphlet. For Best results download the PDF image. Then View and Print from Adobe Reader, or else the fonts can get mangled. For printers that will print on both sides of the paper. “Shrink to FIT” when printing. What does the Bible teach about Mary ? What does the Bible teach ? How many Sacraments are there? Word is not in the Bible. Hail Holy Queen : The Mother of God in the Word of God. Is This Pamphlet Offensive ?